On paper, VCE is a free-standing company -- a joint venture between EMC and Cisco, with participation from both VMware and Intel. But many of us here at EMC don't think of them that way: they're a key part of our cloud strategy in the marketplace for enterprise customers and service providers alike. At the time of introduction, their value proposition was somewhat controversial: in exchange for asking the customer to conform to certain configurations and operational processes, a vastly superior result could be achieved. That bold claim is neither theoretical or esoteric; it's now been backed hundreds and hundreds of customer environments. 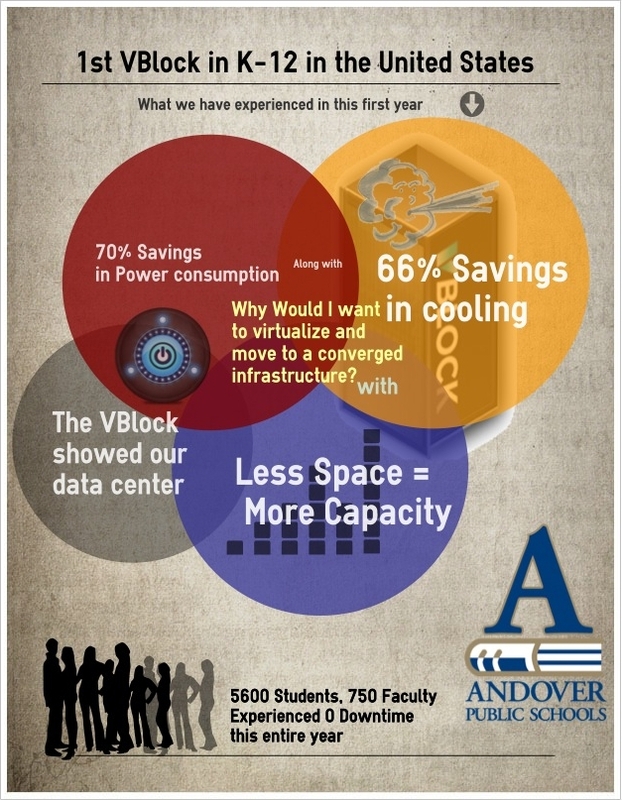 Proof points are everywhere, including this home-grown infographic from a typical VCE customer. In a recent post, I asked Todd Pavone if anything had shown up in the marketplace that was creating a serious alternative to the Vblock proposition. His answer -- in a nutshell -- was "no, not yet". Part of the strength of Vblocks is the VCE organization itself: over 1000+ professionals with one mission: deliver a superior, integrated customer experience. As part of the EMC World 2012 festivities, VCE is announcing a number of enhancements which further extend and differentiation the Vblock proposition. If you head over to the VCE website, you'll notice two primary families: the 300 and 700. Both provide an attractive starting point with considerable expansion capacity. Underneath the covers, the 300 is based on EMC VNX technology, the 700 is based on EMC VMAX. The new 700 LX thus is the new entry point into the big-boy Vblock: based on the VMAX 10k storage platform. No slouch, it can expand to 64 half-width Cisco B-series blades on the compute side and 1080 VMAX-powered storage devices (disk and flash) on the back end. Think you'll need more in your Vblock over time? Consider its bigger brother, the 700 MX -- up to 320 half-width UCS blades and a VMAX 20k powering up to 1920 storage devices. Idle thought: I wonder if someone at VCE is thinking about a "Vblock 900" that uses the full power of a new VMAX 40K? Previously, when it came to Vblocks and data protection, VCE (and their partners) did the Vblock, EMC did the data protection aspects. But doing it this way really didn't take advantage of the VCE seamless customer experience model: from configuration to delivery to support, one of the strongest advantages of a Vblock was its customer service model. As part of the latest announcements, VCE will begin to incorporate advanced EMC data protection products as part of the native VCE offering. These include -- among other things -- the Data Domain and Avamar dedupe backup/recovery products, RecoverPoint advanced remote replication products, and -- finally -- the EMC VPLEX. If you're familiar with VPLEX, it can play two important roles in the technology stack. One is enabling near-zero RPO/RTO at a remote site; it also has useful skills in dynamically moving workloads (compute *and* storage) back and forth between two locations non-disruptively. Yes, that's right: we're finally seeing VPLEX being incorporated into Vblocks to start to create "pools of pools". Stay with in the initial guidelines and use cases, and it's reasonable to start thinking of VPLEX as the technology that will -- over time -- enable multiple Vblocks to start acting as a single, geographically dispersed pool of resources. IT organizations typically purchase a variety of components from different vendors, a few pieces at a time. They (or their partner) is responsible for integrating the pieces, qualifying and making them work. They (or their partner) is responsible for updating all the various version levels and microcode, and making sure nothing breaks. They (or their partner) are responsible for problem resolution across multiple vendors. The VCE model turns all this non-value-creating effort on its head. VCE delivers a finished, advanced and converged infrastructure product ready for us. VCE installs it, updates it and supports it. The customer focuses their resources on using it, and not on being an in-house system integrator. But -- to achieve this effect -- the customer has to be willing to adopt new workflows around each of these processes -- from procurement to provisioning to support. Not everyone is motivated to take the leap to the converged model from VCE.